Discussion in 'Assets and Asset Store' started by tomaszek, Jun 23, 2015. UBER is finalist for Unity2015 awards in new AssetStore cathegory. Built on the top of Unity Standard Shader - UBER takes its principles - "standard lighting and core features", but this is only the beginning. Yes, you probably though about it already. So - UBER is what you've been ever dreaming about . Above features are varinats w/o "holes". So, for example - tessellation, 2 layers, triplanar selective with refraction, snow, water flowing on rainy day + some translucency - yes, you're welcome... Just select right shader subtype (tessellation, triplanar, 2 layers, refraction) and enable features (snow, water, translucency, glitter). Initial v1.0 price is as low as $50. Maybe not that cheap, but results are not cheap either and the price seems to be very reasonable comparing to other massive shader packages on the AssetStore . I might adjust it later, will see. Anyway - for users of my current packages (RSP, RTP, VG) I'll probably introduce some upgrade path if possible (at last for RSP users which I promised to). I'm going to showcase it on Unite Europe this week - so if you're participant - take a look at our booth 15A June 24th in Amsterdam ! And results are more than cool (look at the thread header image). Snakpeak at upcoming UBER 1.02 - dynamic weather controller (very simple to use - just steer fall intensity, temperature, wind for dry effects with 3 sliders + 1 slider for timescale control). ksam2, AntonioModer, Rodolfo-Rubens and 17 others like this. I am a shader noob. I have just started using Alloy which has really enhanced my scenes. I am not sure if this is a fair question. But do you know if Uber can be used to compliment Alloy to do things Alloy can't do. Or is Uber an alternate to Alloy? Alloy relies on its own lighting pipeline (GGX), while UBER is built on the top of Standard Shader. Then - there will be features that are unavailable in UBER while they are available in Alloy. And vice versa. You might need to go thru features list and compare. I think it is possible to mix shaders together. At least in forward lighting path (in deferred Alloy might redefine lighting shader it's own way while RTP makes the same). I'd say - UBER is alternative to Alloy depending on what you're like to do. And it would be better to ask users when they will get familiar with my product because I'm not the right person to compare publicly the two. Obviously I'm biased competitor to Alloy . Dynamic snow is good. But what about dynamic 'sand' for desert scene/project? Very interested in this. However,r the demo eventually had a "fatal error" that shut it down. Most of the effects, everything besides the refraction, actually, didn't do anything. Some were empty scenes it looks like. Are there any known issues at this point? congrats, hope it'll be accepted soon. Review team can take a long time sometimes. i know standard shader run well on mobile if we limit the number of textures but will this works on mobile or its better to only use standard shader? Meltdown and LoDx like this. I really like all the beautiful PBS art that has been produced lately, but in some respects I wonder if it is getting a little too "architectural digest" and maybe no longer so game-friendly. Not so long ago, you had diffuse shaders and then a few FX shaders based on diffuse. Now ...? For example, if I wanted to highlight that figurine in the first picture as an object the player should interact with, normally I'd put a pulsing outline on it. Are outlines still a thing in this new PBS world? What about other effects, like disintegration or a fade slider, and so on? Or is there some other way of getting these common sorts of game goals accomplished? Sorry if I'm being stupid about it. Just an honest question from a person who doesn't know. BTW, I've tried the webplayer and the download, and I don't see any adjustable translucency in the examples on either version. I move the slider and I see no difference. The still picture of the figurine above is much better than what I see in the webplayer or exe. Webplayer examples showed not all pieces and ended with a fatal error. As an owner of RTP, i´m interested in this shaders and the discount. I opened web player again, and on OSX the examples didn't work at all, i think. Hebe, Candle and Amber for example has no translucency, Pom Cube is just flat. So this doesn´t work on OSX at all. The pictures above are nice, but OSX realtiy is miles away. Change the color of "snow" with its dissolve, normalmaps and you've got the sand covering your objects on the desert . SM3.0 (16 textures, 9 interpolators) is required / SM5.0 preferable if you'd like classical tessellation and better performance. If you're on openGL machine it can eventually happen. I could not test it fully on this because my Unity5.1.1 just crashes on forced open gl mode in Windows. So - opengl users should probably wait longer for stable GLcore (up to 4.3) functionality on Macs (I assume from Unity blogs that tessellation will also start working on Mac in some predictible future). Car paint example is not "car paint shader", it's UBER core shader with features that can mimic it (just a little). UBER is multipurpose shader system (if this will go into more specialised pieces - I'll see). On translucency you need to point the camera against the light (you can find it on the skybox). And the object should be placed between the light source and eye. Then translucency reveals. I've noticed point lights get turned off translucency on webplayer I probably made some stupid bug when publishuing it last night. Will try to fix it quickly so candle flame will produce translucency no matter where the camera is pointing from (because point light is placed inside the candle). The same for ice cube. If you ask for "does UBER cover any shading scenario" ? The answer is - no. There is no such shader available in the universe. Could Unity Standard Shader make dissolve or outline ? No. It can't because it's general purpose shader. Like UBER. The difference is that UBER has a lot more features added. And additional ones might be also considered later. This is initial release. If people will really need dissolve or outline shader with PBR we'll see. At this point it's pumped with features enough I believe . And in Layman Words -> does it works on mobile too ? Yes ? No ? I particularly like the ice block thingy and the candel visuals. I also like the POM ones, but at certain angles it behaves really weird. Didn't have any problem with the demo, it gave an error the first time it loaded, but then it worked on second try. In human language it's: no gles, very limited on gles2, might work on gles3, but I generally need to make it working on openGL first . This looks very interesting. If you're planning to add in the possibility to colorise the albedo map (with detail maps defining where to colorise) like in this shader I'm completely sold. EDIT: Translucency is DX11-only, right? That's what i expected. Thank you for confirmation.. I was assuming translucency was DX11 because it doesn't work for me, I'm using a GT650m. We are deferred + Alloy. This means any forward passes will be slower to render, otherwise this should work fine, I hope? Will it work on PS4? What performance delta do you anticipate vs Alloy? Very impressive looking! Will it be possible to extend or modify the shaders ourselves? I'd like to add a color ID map/texture for updating the albedo at runtime based on the RGBA channel of that map. This looks fantastic! Is available for purchase? Are you rotating the object to occlude the light source? Haha, I feel pretty dumb now. True on both counts. I was assuming the candle's flame had a point light attached to it to accentuate the translucency for the candle. Wow, just wow. You can add UBER graphics setting with this shader! Is this price permanent or it's going to increase? On translucency you need to point the camera against the light (you can find it on the skybox). And the object should be placed between the light source and eye. Then translucency reveals. I've noticed point lights get turned off translucency on webplayer I probably made some stupid bug when publishuing it last night. Will try to fix it quickly so candle flame will produce translucency no matter where the camera is pointing from (because point light is placed inside the candle). Ah, okay. I can see and adjust translucency when I put a light behind the Hebe figurine. I still don't get much from the amber chunk though, and the ice looks odd. I noticed when running the candle demo last night that sometimes it worked better on the second run-through, for some reason. 1) Are these stain effect coming from the image effects dirt lens cam? 2) The translucence is not very visible on my system , including the Hebe model. 3) Another glitches cause while coming close to the relief shader example. 4) No translucence effect on the Static Snowball. I lost to ask for linear mode, would UBER work with too? You can actually see translucency in your snowball screenshot. It looks a lot like fresn rim light, though. Wow, 64 bit player is amazing! Thanks for the discount too, Tom! I have your RTP Asset is there anyway i can get a discount? Purchased it, brilliant asset Tom, outstanding work. If possible please post a quick video on the different features (especially with wetness and translucency maps) which will help us get started in integrating them quickly. 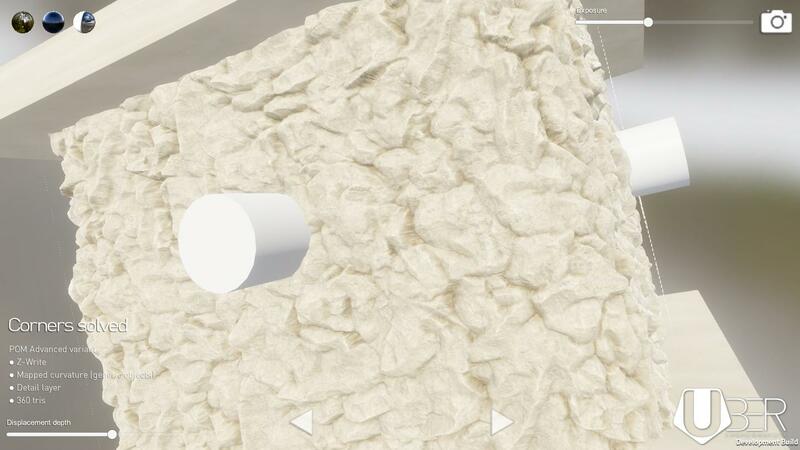 Also a quick question, I guess if we use multiple maps it would results in an increase in drawcalls, would it be possible to use tools such as mesh baker to compress materials with the Uber shader? Thanks again for making this asset available . Did you open the Asset Store and navigate to the item? My update price was there without me doing anything. The only word that I can use (and be tasteful) is "Eye-gasm"
Looking awesome and sounds like what I wanted from a "Standard" shader in the first place. Amazing! Just purchased it! Thank you for the upgrade price, super! "Assets/UBER/Editor/UBER_StandardShaderGUI.cs(523,17): error CS0246: The type or namespace name `ColorPickerHDRConfig' could not be found. Are you missing a using directive or an assembly reference?" Do i need to import something else? Looks like my unity project is missing this, any tips? Seneral, TaesikYoon and pureumireu like this. It really looks quite amazing... but when I open the example scene and select the objects in the hierarchy, I get a pretty bad memory spike up to 7GB. Could there be leaks somewhere? Edit: Scrap the comment below, I just found the Uber Global Params! Tom you're a legend! Just wondering, how difficult would it be to have a cubemap override included in the Uber shader? So far there hasn't been a solution with Unity5 shaders to support environment/buildings with destruction. One which solves having the interior and exterior faces of a building having the proper cubemaps to represent the right reflections, without having to seperate the meshes. This would be very useful when buildings have multiple materials, one outside, one inside etc. You're refering to 2 separate shader solutions. I'm afraid they can't share the features together, but you'd need to ask HueShift guy about it. No, translucency is approximate model. It doesn't need DX11. Theoretically it can run on mobile when I'll make it working on openGL, it doesn't need any huge computational power. It has, but for some reason (and the reason I posted this late in the night) I turned it off for webplayer. On standalone build you can see it on all point lights - candle and iceblock had it inside. First I'd probably need to buy Alloy to check how it's realised backed for deferred. I'm affraid they use free Gbuffer channels for somethig. The same for UBER (translucency and self-shadowing). So - in case you don't use translucency in UBER you can simply use both - Alloy shaders and UBER ont the same scene. Otherwise we'll need to think about other solution. I hope in time gbuffer in Unity will be more configurable. For PS4 - sorry. I'm much much into its contraints, but I believe it's something silimiar to DX11 in terms of capabilities. Mild corners - I'm aware about this glitch. I hope I can fix it. Meantime - treat "corners solved" as experimental feature (because it is and I must admit I can be used only per object - no batching) - that's the other limitation).